I think that it is possible that Oladipo's development was being suppressed by playing with Westbrook, in ways that George is not subject to. Yeah. George was already an established All Star when he got to OKC. That's different than a young guy trying to develop while RW is jacking 35 shots a game. "We're two years into the age of full Russ and they're 3-8 in the playoffs despite having a second All-NBA caliber player and a very good center both seasons." WADR, I think this is pretty slanted. To use a Pelton meme, teams win titles (and playoff series), not players--and ofc, Western Conference. And they lost Kevin Durant uncompensated. Also, how big of a deal is it to have a good traditional 5 right now? I think people tend to assume that high-end guys who "jack a lot of shots" are more negative to outcomes than they actually are because of the jacking. Finally, I think George's decision to stay there tells us something. YMMV. Alright what's the final return on the Noel/Okafor/Holmes transactions? Muscala, a million dollars, and a couple 2nds? Took me a while to figure out what this means. It feels strange that rr tends to make me feel old with his use of abbreviations and acronyms given that I'm one of the younger people on this thread (I think). Noel was traded for 2 seconds and Justin Anderson. Anderson is gone now. One of the seconds was sold. So they've netted a 2020 2nd from Dallas. Okafor was traded with a 2nd for Trevor Booker who was later waived. I think that's the Knicks 2019 2nd. Holmes was traded for cash. Anderson was traded with TLC for Muscala. I don't think they got a pick. So the Sixers have given up Noel, Okafor, Holmes, Stauskas and TLC and gotten Muscala, some money and swapped a 2019 second for a 2020 second. Hmm probably shouldn't throw Stauskas in because they got the 1st and a pick swap in the original Stauskas deal (granted they screwed the Kings pick up in the Fultz deal but still, that's a big win). i kinda want to say the sixers are better than last year, but i'm not feeling it. Yeah, I'm definitely overstating my opinion because I don't like the Thunder. I don't think you can totally separate Russ's unique attitude from Durant leaving. I also think Adams is a good player, even if overpaid. He's not a particularly efficient scorer, but he's an outstanding playmaker and scores in volume because he works incredibly hard and never gets tired. I don't really believe that there's any special impact to him missing a lot of shots outside of them being missed shots. It probably nets out to him being about the 5th best player in the league. Still, I hope very bad things come to the franchise. I realized this offseason that Lebron going to the Lakers has made me at least neutral on LA, but Lebron going to OKC would make me hate Lebron. Is it really even controversial that the Durant-era Warriors are the best team ever? Well according to approximately every player who played before 2010ish, each previous iteration of every team, ever, would have easily dispatched the Warriors. But seriously, yes, I'm sure there are many people who would still take the 96 Bulls, 86 Celtics, and/or whichever is the best iteration of the Lakers. If you weight playoff performance highly, you might argue for the 2001 Lakers. If you weight regular season highly, you would value the 1997 Bulls. If your dominant heuristic is superstar ability, scouting, quality of opposition, or defense, you might value any one of a number of teams more highly. Edit: If you're Bill Simmons, for instance, you would take the '86 Celtics because you have no intellectual honesty. Finally, I think George's decision to stay there tells us something. YMMV. Maybe. It could also possibly just mean something as simple as PG and RW became really good friends, and winning a title isn't everything to George. I mean, he said he wanted to be traded to the Lakers after a season where LAL won just 26 games (and averaged just 23 over the previous 4 years), and this was a full year before anyone knew LeBron was on his way. Maybe enjoying what he does - whether it's because of familiar places or familiar faces - is just higher on PG's wish list than bringing home the hardware. I think 3514 makes a very important point: different players will optimize their lives for different outcomes. PG certainly realizes that he's not going to be able to win a title in OKC as things are currently constituted, and he's decided that that just isn't as important to him. Slightly harsh. 538 (using Elo) had it (pre-KD! ), 95-96 Bulls/96-97 Bulls/15-16 Warriors/14-15 Warriors/85-86 Celtics. If you weight playoff performance highly, you might argue for the 2001 Lakers. What do the 2001 Lakers have over the 2017 Warriors? The Dubs had an equally dominant postseason, and a far superior regular season. To give the devils their due, though, I still think the 2001 Lakers curbstomping of prime Duncan and the 58 win Spurs in the WCF was probably the most impressive series I've ever seen, considering quality of competition and all. I don't know if I've ever seen a team that good lose that convincingly before or since. If you weight regular season highly, you would value the 1997 Bulls. My use of internet abbreviations notwithstanding, I am one of the older guys on the thread, so I actually saw the 1980s NBA in real time. I think that the 86 Celtics and 96 Bulls are on the same level, adjusting for timeline, as the current Golden State team. The 87 Lakers were tic below those three. Those are the four best teams I have seen in my lifetime. 1. Which team had the best year? 2. Which team had best multi-year run? 3. Which team had the best metrics? 4. Which team would you pick in a best-of-7 if you could somehow adjust for time and space and rules changes and they could play each other? 5. Any secondary factors to consider--expansion, injuries, etc? One key thing with GS is that they could easily have won four consecutive titles, although I think it is possible, although not likely, that Durant goes elsewhere if GS had won the 2016 Finals. Anyway, Golden State has a very good argument for best ever, and they are not done. That was supposed to be a joke. Sorry, sometimes I can be too dry. Whoops. I always mix up which year was the 72 win team. I'd like to see their KD-era rankings, not sure if those exist somewhere because 538 is mysteriously very motivated to prevent people from reading their own content. This is fair. I am assuming you don't like them because of the Seattle dis-connection? I can't get super excited about the all time team rankings because there is so much gray in these things. Like I'm pretty sure the 16-17 Warriors are better than the best Heat team- if they played 100 times the Warriors win the most games- but I could absolutely see the Heat winning a 7 game series given the right breaks. It will always be controversial to say a particular team is the best of all time. The Warriors are in the conversation and I'm good with that. Pelton's list is pretty good. Obviously, it's fair to argue with a ranking here or there but, if you were to divide it into tiers, I'd say the tiers are pretty accurate. I'm surprised the best Heatles teams are relatively low, I guess. I'm a bit surprised that the 73-9 Warriors team is only 25th. Yup. I moved to Seattle weeks after the Sonics played their last game and have spent 10 years without a home NBA team. Between Yogi and Bjelica, "Role players reneging on agreements with better teams to sign with the Kings" is one of the weirdest under-the-radar subplots of the offseason. I was too, but the rationale makes sense: their postseason net rating suffered after Curry's MCL sprain, and there's a standardized penalty for every win shy of a championship. I believe they had one of (if not the) strongest regular-season scores in the whole set. My thoughts exactly. They weren't a dynasty, due to only 1 title, but Malone/Jones/Erving/Toney/Cheeks is a very solid group. Yes, I know that started Iavaroni, but that's a great team with 3 Hall of Famers. I originally typed 4, but Bobby Jones actually isn't in, and that surprised me. 10 All-Defensive First teams(8/2 NBA/ABA) plus a Second team nod, is pretty awesome. We're two years into the age of full Russ and they're 3-8 in the playoffs despite having a second All-NBA caliber player and a very good center both seasons. Playing in the west against good competition with the second all-NBA player only one of the years and a #### supporting cast pretty much as Durant’s burner account would tell you. This year they got a pretty tough matched in 4/5 as they probably both would have been the best team in the east. I’m not willing to call Oladipo an all-NBA player that Russ played with either as he didn’t look anything like that there or in Orlando. Sometimes young guys just improve a lot. Oladipo may have also not be able to sustain last year, though I like him as a player. I think Westbrook has his flaws but as rr would say the dislike of him seems personal/philosophical to his style rather than really rooted in stats. Suffice to say, yes, my dislike for Westbrook is personal. I acknowledge that. Yogi Ferrell backed out of his Mavs deal to sign with the Kings. I think they are but man that year he has them #1 the Spurs matched up with them well, played them well in the regular season, and I think they really would have pushed the Warriors. I guess Lowe and some treat every LeBron team as a real championship caliber team but I think moreso they beat a Spurs team that was roughly the 47-win team but likely worse as this team had a whole season for folks to get comfortable with expanded roles and then yeah I will give playoff-LeBron a bit of a bump but still have that team as a very weak Finals team, even if not early-aughts East level. "sure, i'd listen if the lakers call"
I like Beasley way more than plus minus does. The D isn't good but he can soak up usage with credible efficiency and seems to have cleaned up in terms of things like professionalism. Not sure he makes sense in LA, though. Couldn't you say that about pretty much all their moves other than LeBron? It's like they drew names out of a hat. Re: 3523 - one thing I've always wondered about the Miami teams - given how Pop, given a second chance, didn't just beat the Heat, but blew them off the floor in all 4 of the wins for SA - did he find an Achilles heal or something that could be exploited repeatedly? In other words, could this have been figured out earlier? Was Miami actually lucky to have won 2 championships? I'm also wondering if the outcome being so one-sided hastened LeBron's exit? Maybe if Miami 3-peated or at least put up a good fight LBJ might have stayed longer? Hmm...heres a thought...was LBJ already mentally out the door before that series even started? Could that be part of the reason why SA won so easily? Re: 3523 - one thing I've always wondered about the Miami teams - given how Pop, given a second chance, didn't just beat the Heat, but blew them off the floor in all 4 of the wins for SA - did he find an Achilles heal or something that could be exploited repeatedly? In other words, could this have been figured out earlier? Was Miami actually lucky to have won 2 championships? Well, the 2013 Heat won 66 games, and the 2014 Heat only won 54. I know a lot of people (myself included) assumed they were just coasting during the regular season, but I now think it's more likely that they really were just simply a much weaker team. LBJ seemed mentally out the door in the 2011 Finals. Never got that sense in 2014, though it's hard to remember everything. The Spurs just perfected the game of basketball in those playoffs. I was sorta snarkily thinking to myself, that 'yeah we know, have you been living under a rock' for a few seconds. That's way too kind. Randomness would give a non awful result once in awhile. They just got every weirdo guy on the market. I've never seen better offensive basketball than what the Spurs did in Games 3-5 of that series. I actually like this strategy for the Lakers. They still have all their young guys instead of trading them, didn't burn any long-term cap space, and it's at least possible that "weirdo guys" are undervalued. Maybe they think LeBron can keep these guys in line and/or stop their chucker tendencies (Beasley). I don't think it's totally crazy. I do think it sets them up to be the most hated team though (I at least will generally give that spot to the team employing domestic abuser Lance Stephenson). McGee, Beasley, and Rondo were actually all arguably reasonably productive players last year. McGee was on the champs and played fine, Rondo's team had a good year and Rondo was seen as contributing to it, and Beasley was I think seen as being OK in New York. If Magic and Pelinka had brought in three "normal" guys with the same numbers, people would be asking questions about fit and floor spacing, but the signings would not be seen as noteworthy in a negative sense. And yes, I think it is clear that the Lakers believe that James/Walton/Magic can keep the lid on. That said, I would rather have had Lopez than McGee, would have avoided Stephenson, and as noted, with James, Ingram, and Kuzma; and with Svi Mykhailiuk looking good in Summer League, it is hard to see where Beasley fits. The Randle/Rondo switch...don't really like it, but I get it, since it is clear that no contracts beyond one year was Priority 1. I think the other angle is that Magic/Pelinka wanted depth in case a scenario arises in which they can move two of Ball/Ingram/Kuzma in a deal for an All-Star. And yes, these moves give the Lakers a 1980 Oakland Raiders vibe, but probably without the excellent team. That's TEN-YEAR NBA VETERAN Michael Beasley. I do think it sets them up to be the most hated team though (I at least will generally give that spot to the team employing domestic abuser Lance Stephenson). They're the Lakers. They are never going to be far off the most hated team, no matter what. And Lakers fans are already plenty used to supporting those kind of players, and excusing that kind of behavior and worse. Yes. There's a difference between these signings, but they all get lumped together because they're all memes. McGee and Beasley are both reasonable signings. Low money, guys who have flaws, but excel in one area or another. You sign Michael Beasley not based on how he matches up with the Warriors in May, but because you need some bench scoring in December. The Lakers already have his (slightly upgraded) doppelganger in Kuzma. Rondo and Stephenson are the head scratchers. Rondo because of the money (9 million in a market where he probably gets the minimum or mini MLE otherwise), and Stephenson because of the lack of talent. That said, none of this is that bad because they're all 1 year deals. If Rondo is the backup PG, sulks and gets cut, it doesn't really matter. If any of these guys act up, don't get with the program, you just cut them. There is no long term commitment. 3552--good points. A fan buddy sent me a WTF text about Beasley, and in answering him, another obvious thing that you touch on hit me: although it will of course piss off sponsors and fans, I am sure James will get a few DNP-rests this year. * Having Beasley around will mitigate the scoring loss when James sits. I think the other thing going on, though, is Magic going all Frank Sinatra and Doing It His Way. By bringing in a more traditional 5 instead of going with the slow-footed, floor-stretching Brook Lopez, and by bringing in a poor shooting playmaker with a chip on his shoulder and a Boston Championship Pedigree, Magic is making an old-school philosophical statement about roster construction. I doubt that aspect of it goes that well, but as you say, one-year deals. *Personal note. We have talked about DNP-rest a few times, and I defended Popovich when Silver gave him some crap about resting his stars in a TV game. But I am seeing another side: some good friends of mine, who are not sports fans, are fostering an African-American teenage boy who is a big NBA fan. I told them I would take him to a Lakers game this year to see LeBron, and I am checking the schedule to try to make sure it is a game that James will not rest in. If it turns out James sits, that will not ruin it--it is still an NBA game--but it will bum the kid out. As to Stephenson, I think that is simply LeBron wanting his feisty foil. I compared it to Kobe trying to get the Lakers to sign Raja Bell. Pau for Bazemore. Who says no? Hawks save some $$ in 2019. Spurs add an actual SF, of which they currently have none. Nothing I'm reading about this Noah Syndergaard news is making me want to have kids anytime soon. Hand, foot and mouth isn't that bad but you wouldn't want to play baseball through it, nor hang out with your team. I think Pau does, right? They sure seemed to have some kind of "arrangement" when Pau opted out and they re-signed him. I would guess there's some kind of non-contractual wink/nod handshake elements to that deal. So this is probably going to be a mistake, right? Harris is not getting the full max from the Clippers next year, obviously, and I can't imagine he gets the 4 year from anyone else unless some team is committed to one-upping the dumbest moves from 2016. So, this thread has no velocity in the doldrums of the summer. No one seemed too keen on re-ranking the top 50, how about a different exercise? Examples could be: (1) anticipating All-Star rosters, with a short blurb on each guy; or (2) "surprise" players this coming year (both positive and negative, rookies included), or (3) teams you expect to go up or down? I thought there was some interest in doing an updated current top 50 but not in rehashing the historical one. How about this: on average, about 5 players are first time All-Stars each year. Name your 5 picks for first-time All-Stars this year. What's the math, East to West for two perennial All Stars (LeBron, DeRozan), and West to East for one (Kawhi)? Just trying to get a sense of how many openings there might be. The West is just so difficult to crack. Davis, if healthy, is a lock. Then there's Towns. Last year Cousins made it, so that's theoretically an opening. Aldridge did, too. Gobert seems like a good bet, if he's healthy, to take that Cousins spot. Conley, I think there's basically no chance of that. Curry/Paul/Westbrook/Harden, then there's Lillard and Klay. Similarly no chance for Mitchell I'd guess. I like the Simmons pick in the East. The Wizards should cut him immediately. Yes, although if you are looking at deltas from 2018, Kawhi didn't make it (for obvious reasons). I think whoever signs David Nwaba for the league min will get a steal. (3) teams you expect to go up or down? I'd add Memphis and Dallas as locks to miss the playoffs. And Houston and Golden State as locks to make it. So that means three of these teams will miss the playoffs: Portland, OKC, Utah, N.O., San Antonio, Minnesota, Denver, LAC, and LAL. I can see OKC flaming out; I can also see Thibs running one or more of their Big Two And A Half into the ground, and the wheels will come off really, really fast in that case. I would expect Utah to push strongly for #3. Is LAC not a lock not miss the playoffs? I don't think so, no. I'd probably put them among the group of three most likely to miss the playoffs, but not a lock. Right now I'd probably go with the Clippers, Wolves, and for some reason I feel like Portland has a collapse in them. Or New Orleans due to a Davis injury. Those are all really solid teams, though, it's amazing how deep the West looks once again. Even though I feel like the Kings, Suns, Mavs, and Grizz are locks to miss out, all 4 should be better, maybe even much better, than they were last year. If I had to bet my life on any of those teams making the playoffs, I'd probably go Utah because of their home-court advantage, and they fact that their Pythag record last year was 53-29. Weirdly I think they Schroder fit will be good for OKC as a poor man's Westbrook off the bench in terms of continuity of styles. 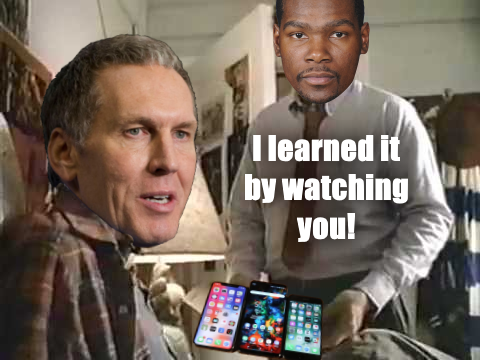 Getting Roberson back will be a big plus as well. I think Joe House threw out the idea on Simmons' podcast that the Lakers are basically tanking this year by bringing in these guys on one-year deals, and will be happy to let LeBron coast through a year and load up for 2019-20. I'm not sure I buy that, but the same thought had crossed my mind. I think I'd actually make the Lakers the 3rd lock in the West (though not in 3rd place), just because I can't imagine LeBron not making the playoffs. You know, Dwight Howard doesn't seem like a bad guy, most of the time. But he might be the first player in NBA history who's so corny it turns him into a locker room cancer. "We've got the best player in the game when he's 33, so let's throw next season, to compete when he's 35" seems like a completely insane idea. I know LeBron appears to be eternal, but time has to catch up with him at some point and, at his age with his mileage, there should be a greater sense of urgency than this. Also, I'm not sure if LeBron is capable of coasting for a year. Back a couple years ago when I had a daily commute I'd turn on Jim Rome to kill some time in traffic, and Rome would play the "I've been a champion my whole life" clip from Dwight quite often. It made me laugh every time. Pelinka and Magic seem like nice enough, competent guys but I don't think they are anything more than a fairly average NBA FO. Like if you put them in Chicago or GarPax in LA you'd probably see similar results as Chicago and LA have now. Granted there are probably only 3-4 FOs in any given major sport at any given time that move the needle, and in LA, with all its inherent advantages, mediocre might do just fine. LeBron's mentality is also my hesitation: I can see the argument for saving LeBron's miles, then signing a star or two to make a real title run with LeBron/Lonzo/Ingram/Hart. But I also can't see LeBron actually going along with this. I have to say I find the LAL situation really fascinating. That is not going to be a good team next year, as currently constituted, and I can easily see them missing the playoffs. If I, with my superficial knowledge of basketball, can see that, then LeBron can as well. So what's going on? It's gonna be super interesting to watch, I think. Anyone have thoughts on the new twitter account @the_bball_index ? Woj: "Memphis has agreed to trade Jarrell Martin and cash to Orlando for Dakari Johnson, league sources tell ESPN." then LeBron can as well. So what's going on? It's gonna be super interesting to watch, I think. I think Lebron knows his career is winding down and has decided for perhaps the first time in his entire life that enjoying life off the court might be something he considers while he's still actively playing. I don't think 27 year old Lebron is going to LA if he's not guaranteed to have another star or two join him. I also think that Lebron knows he's at worst tied for GOAT status and that to convince everybody else he needs a few more rings, which isn't realistically happening anywhere, so why not enjoy LA for the last go 'round? It's going to be interesting imo to see how Lebron is received historically by Laker fans if this does not end in a title. I'm not sure to what extent I (dis)agree with this: maybe it's just that I see much larger error bars in either direction on my predictions here. They're certainly not a team that will outplay their talent level due to brilliant, jigsaw-like fit of skills throughout the roster; but they have quite a bit of talent, albeit much of it centered in the person of LeBron. I could see them squeaking into the playoffs largely on LeBron's back, then outplaying their seed based on the intensity, physicality, and intelligence ([insert Stevenson and McGee jokes here]) of many of their players. I don't think anyone sees them as a serious contender, but I won't be ready to write them off until at least the 20-game mark—and even then, only if dysfunction or lack of spacing is at crisis level rather than merely missed opportunity level. a team with the Lakers' projected offensive and defensive ratings would win about 50 games, which would figure to put them in the mix for third in the Western Conference. That projection is tempered by the tendency for teams who add a superstar like LeBron to underachieve in their first season as they build chemistry. However, the Lakers can still improve as they fill out their roster by signing minimum-salary players who are better than replacement level. In particular, Randle's departure leaves the Lakers thin at center, a position where replacement-level players have been more effective than any other. The Lakers don't likely have a path to challenging the Warriors next season, even with James. But after five seasons in the lottery, L.A. should again challenge to win a playoff series or two while building something bigger and better for future seasons. the melo trade is being held up for "reasons"
...You can’t sit here and tell me that I can only use 10 when you can only use 10. Because in order to see the number 10, you have to pass it to 11 and look back. You know what I’m saying? luke walton will resign three days into training camp, citing mental fatigue in a press release; he'll be replaced by his father, who will coach the lakers to an 82-36 record this season; they'll miss the playoffs by 7 games. Yeah, the more I think about it, the more I think I let the flow of the conversation color my take; rr's link in  is a good one. The Lakers will do better than "squeak" into the playoffs, though I stand by the rest of . 1. The "tank with LeBron" was not planned as a strategy. They tried to trade for Leonard and presumably would have tried to sign George. It just worked out that way because James was, surprisingly to many, willing to come here without a second star secured. 2. As noted, McGee and Beasley are not bad players, and arguably neither is Rondo. Floor spacing is going to be an issue, but these three guys do have certain skills on the floor. 1. James stays healthy and effective for three years. 2. They score in FA in 2019. 3. The young guys get better and/or fetch a star in trade. The Clowns and Bastards will affect these things, but not that much. That said--the team needs to have a contending roster in place at this time next year, and that is far from a certainty. So that means three of these teams will miss the playoffs: Portland, OKC, Utah, N.O., San Antonio, Minnesota, Denver, LAC, and LAL. LAL- Lebron is worth many wins. I think Lonzo will be better and Ingram will be a lot better. OKC- Once PG settled in last year, they were very good. Melo is addition by subtraction. They're not as good as their tax bill, but they'll make the postseason. UTAH- They play defense better than any of these other teams do anything. SA- Aldridge, Gasol, Ginobili not getting younger. Slomo, Parker gone. Desperately need Pop to get more out of Derozan. DEN- Narrowly missed last year and seems like more Millsap should make up the difference. MIN- 3rd last year until Butler got hurt. Crawford was a gaping wound last year and he's gone. Towns and Wiggins should theoretically get better. POR- I might overrate them because I REALLY like Lillard. Even if a lot of their role players are overpaid, they're real NBA players to go with 2 stars. LAC- I'm pretty willing to just rule them out. Lots of very young players plus good role players. NO- Signing Randle to go with Davis and Mirotic seems to undermine the secret sauce that catapulted them into the playoffs last year. Breaking it down that way, I think I would have the Pelicans, Clippers, and (gulp) Spurs on the outside looking in. In reality, I think the answer is that something like 2-5 of these teams will get taken out of the playoff race due to injury. Last year, injuries took MEM out of the race entirely, forced MIN and DEN into a game 83 playoff, and pulled SA from the upper echelon to barely making it. Hombre came up with it after the Rondo signing. I will meme it, I think. Memphis will win more games than the Clippers. Memphis as 7 seed, also above New Orleans. West is going to be loaded this year! The Golden State Warriors were a team Howard considered after the trade to Brooklyn but said he changed his mind when Wall called to ask, “You want to come to D.C.?” “I was like, ‘Nah, this is the spot right here,’” Howard said. "I have not heard thrilled," Kawakami shared. "I've heard bold, I've heard risk taking is good, and I've heard—I haven't reported this, so maybe this will get aggregated—it's better than Dwight Howard. Dwight Howard was a no. That was a no in a lot of precincts of the Warriors, flat-out no. So DeMarcus Cousins, against that backdrop, is a thumbs up." So, which is fake news? On the Lakers and the playoffs...I would be a little shocked if they missed but I feel that way about, like, 10 teams in the West. So, while I think the Lakers will make it, the margin for error is slim and if LeBron misses any time they could be screwed. I don't know the context of the first quote, but that sentence says that Howard considered Golden State, it doesn't say that Golden State considered him.